De-perimeterisation and consumerisation of IT in the enterprise presents challenges and opportunities in almost equal measure. Intellect brings over a decade of expertise to bear on this most pressing of security conundrums. Experience insightful perspectives on how an organisation can successfully develop cohesive data centric security strategies by leveraging some of the most innovative technology solutions available today. The PKWARE Solution is the only complete solution for reducing, securing, moving and storing data across the extended enterprise, both internally and externally, from mainframes to servers to desktops and into the cloud. PKWARE offers software solutions to critical IT problems, namely the explosive growth of data, the need to secure data, and the emergence of data in the cloud. PKWARE offers the only total solution for reducing and securing data in motion or at rest, so data can be securely moved or stored anywhere. The PKWARE Solution is used billions of times each day to manage risks associated with data security breaches while avoiding increased storage costs with data reduction of up to 95% and improving service delivery. 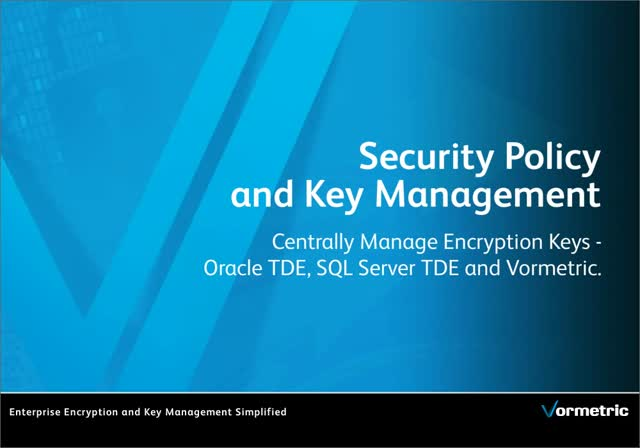 Gain an understanding of the architectural underpinning of Vormetric Data Security, a comprehensive solution for enterprise encryption, enterprise key management, and access control for data at rest across distributed systems. 96% of records breached in 2011 involved theft from server platforms. Take away 6 key considerations for developing a strategy to protect critical business data.